You can read the latest news from the developer in this section. We recommend subscribing to our RSS feed to stay up to date with the latest news. What's new in Kerish Doctor 2019 (4.75)? Today, we present the last update of the current version of Kerish Doctor (4.70) with a few minor bug fixes. The next update will the release of Kerish Doctor 2019 (4.75). We regret to inform you that due to a large number of optimizations and improvements that we are working on, the release of the new version has been pushed back from the beginning of the year to spring. Our team is busy working on the upcoming release and is doing everything to make it happen as soon as possible. "Apps Performance Optimization" is a new component based on our proprietary technology that intelligently allocates CPU time to running applications to improve the overall performance and PC responsiveness. Our new technology safely and reliably maintains app performance at an acceptable level under heavy CPU loads. As requested by multiple users, we have added an ability to choose the UI theme for Kerish Doctor – dark, light, etc. The interface of the program is now fully optimized for large screen resolutions – for example, 4K displays. Full support for cleaning the remnants of programs to be deleted "on the fly" after their uninstallation. The program will notify you of the removal of the remnants of the uninstalled application with a pop-up notification, where you can see more detailed information. The new "Fast File Search" tool uses low-level disk access to search for files at an incredible speed – it will only take you a couple of seconds to find any file on your hard drive. Added an option that automatically shuts down the user's PC if a particular component (video card, hard drive, CPU) overheats, thus physically saving your hardware. Improved the "Confidential Data" tool that automatically wipes out all of your personal information from over 100 applications with a single click. Improved the "Check Installed Software" tool to enable it to automatically remind you about new updates and software releases. Added an ability to search for program reports and a large number of other improvements. The release of the new version of Kerish Doctor 2019 (4.75) is scheduled for this spring, this is the final extreme release date. The program will automatically update to the new version on the day of the release. During the holiday season till January 15, 2019, buy any license key and get +1 year FOR FREE. We recommend taking advantage of this offer, when the newest version of Kerish Doctor 2019 (4.75) will be released. The new version will come released with new interesting features. Purchased license key is valid for all future versions of the program. One of the largest sale events in the world, Black Friday, will take place on November 23, 2018, and we couldn't stay away from it. From 23 to 26 November, 2018 we offer a 50% discount on all license keys. Don't miss your chance to purchase Kerish Doctor 2018 weekend sales at a great price! We are happy to announce our autumn offer. With a purchase of any license key in the month of September 2018, we will give you +1 year FOR FREE! Do not miss out on the opportunity to purchase Kerish Doctor 2018 in September on these favorable terms. Added "Hardware Monitor", which controls the status of PC devices, automatic optimization of free memory and many other tools. Significantly modified existing tools, added protection from unwanted and malicious extensions web browsers. In addition, added reputation for installed software - the program recommends uninstalling software marked by multiple users as unwanted. Improved user interface, stability and added many other improvements. During the holiday season till January 5, 2018, buy any license key and get +1 year FOR FREE as our New Year gift! We recommend taking advantage of this offer at the beginning of the new year, when the newest version of Kerish Doctor 2018 (4.70) will be released. The new version will come released with new interesting features. Please note that the purchased license key is valid for all future versions of the program. We are happy to announce our special summer offer. With a purchase of any license key in the month of June 2017, we will give you +1 year FOR FREE! Do not miss out on the opportunity to purchase Kerish Doctor 2017 in June on these favorable terms. Added a Windows startup optimization feature based on Kerish Cloud data, search for large amounts of data on disks, search for file duplicates, and a number of other useful tools. Optimized the performance of the digital junk search function, added an optional possibility to clean-up application installers. Improved navigation through the program's interface thanks to visual tips, and added a number of other improvements. During the holiday season till January 5, 2017, buy any license key and get +1 year FOR FREE as our New Year gift for you! We recommend taking advantage of this offer around the end of December, when the newest version of Kerish Doctor 2017 (4.65) is released. The new version will come released with new exciting features. 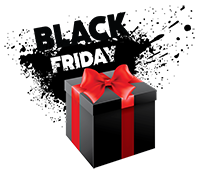 One of the largest sale events in the world, Black Friday, will take place on November 25, 2016, and we couldn't stay away from it. From 25 to 27 November 2016 the cost of all license keys will be considerably lower. Don't miss your chance to purchase Kerish Doctor 2016 weekend sales at a great price! We have made some serious progress in making Kerish Doctor fully international and removing all possible barriers between users and our products. The interface of Kerish Doctor has been professionally localized in 16 languages (including voice notifications), and the official website is now available in 10 languages. The technical support service of Kerish Products has become fully multilingual and can interact with users in their native languages, while the implementation of a Help Desk platform will considerably reduce the average response time. We hope that these improvements will help make our products more accessible to a broad global audience. We are pleased to announce the release of a long-awaited new version of Kerish Doctor in December 2016, which was seriously held back by our large-scale localization effort. The new version of the application will have multiple improvements in its primary functions (repair + clean-up + optimization + protection), new PC maintenance tools, as well as over a hundred other enhancements. Completion of our massive localization task will allow us focus on developing new product versions. We hope that you will really appreciate the improvements we’ll be adding to Kerish Doctor in the future. 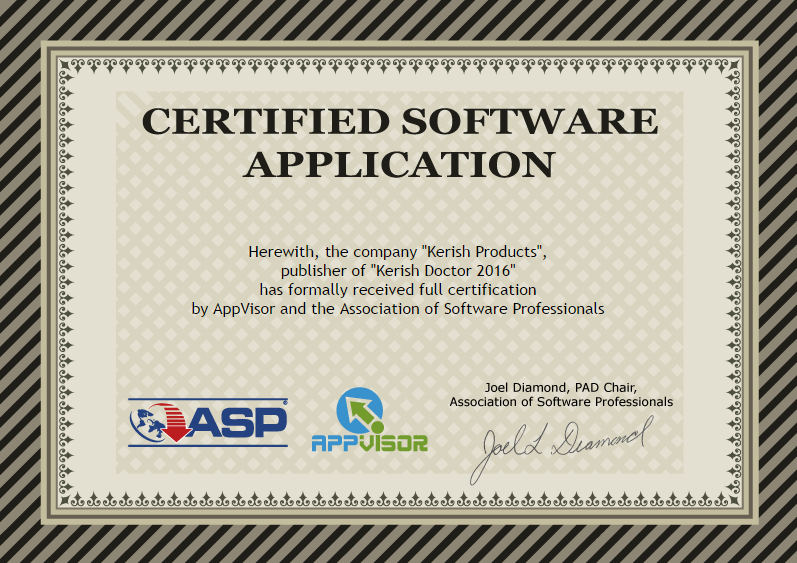 We are glad to inform you that Kerish Doctor 2016 has been officially certified by the Association of Software Professionals that confirms the excellent quality of our software. We wish you all a Happy New Year, and when you purchase during the New Year's holiday season, we will give you +1 year's license FREE! This offer is valid from December 15, 2015 to January 15, 2016. Let's make Kerish Doctor 2015 better together! Is your native language missing from Kerish Doctor 2015? Did you find spelling errors in the application? Meet the Kerish Doctor Language Editor that allows any user to create a new language for the application as well as to edit existing translations. This is to inform you that the official website of Kerish Doctor 2015 now allows you to automatically restore lost and forgotten license keys. The service is available 24/7. To restore a license key, you need to specify the email address that was originally used during the purchase and your license activation details will be emailed to you immediately. Please note that the service is only available to licensed customers, since our database contains only their contact details. We are glad to inform you about a major core update before the release of a new version of Kerish Doctor 2015. This update will provide better support for the recently released Windows 10. The recommendations wizard now contains information on minimizing the amount of data sent to Microsoft through telemetry services. The program can now also clear browsing history and cache in the Microsoft Edge web browser. The update also features an improved tool for unlocking used files, as well as a multitude of small bug fixes. To wish you all a happy New Year we would like to give you +1 year of license FREE with a purchase throughout January! Offer valid until February, 2015. Added a possibility to recover deleted data, a file unlocker, a computer configuration assessment module, and many other handy tools. System registry error fixing is now 25-30% more efficient and covers errors generated by popular web browsers. Improved integration with Windows, better computer protection, new recommendations and a host of other enhancements. We are glad to inform you that our Real-time Failure Detection System has learned to identify and fix problems relating to computer hardware. This includes a broad range of problems – from failures of different hardware components (printers, CD/DVD drives, keyboards, mice, etc) to problems with new device detection. Combined with regular system registry error fixes, this technology makes Kerish Doctor 2014 the most advanced Windows troubleshooting tool. We’d like to note that Kerish Doctor 2014 has received over 20 highest ratings and awards from independent experts and software reviewers to date. These ratings confirm the outstanding efficiency of the program for solving a broad range of computer problems. This version features deletion of empty folders, "Web Browser Extensions" tool, "Integration with Windows" tool, "Scheduler" tool, "File Shredder" tool. Cleanup engine was upgraded and added new sections of diagnostics. We are pleased to announce the beginning of New Year promotion! From December 31, 2013 to January 1, 2014 we give a 25% discount to all license keys. We recommend to use this offer at time of release the new version of Kerish Doctor 2014 (4.55), which will be released on December 15. New version contains a number of interesting innovations. Performed major update of Kerish Doctor 2013 core. Completely re-written source code of detection errors in the system registry. Now detection of errors in the registry of 64-bit Windows systems became 40% more efficient. We are regularly working to improve the algorithms of the program. Already at the moment Kerish Doctor 2013 is one of the most effective and safe programs for preventing and fixing Windows errors. But we believe that this is not enough and be sure we will raise the effectiveness of the program to a higher level of all the products in this class. New version of the program will be released in about a month. We have localized Kerish Products offical site into the Hungarian language. Switching to Hungarian version will be made automatically when it detects Hungarian language in the Internet Browser locale priority. We are pleased to announce the special offer of the month. Buy the License Key and get one additional license year Free of charge! Offer is valid until 30 September 2013. In the current update added a number of new features. In the settings you can now enable notifications about installation of new Windows services or new tasks in the Task Scheduler. Also in the settings is now possible to change the interval of pressed Escape key for Kerish Deblocker function activation, as well as the ability to configure the update only certain components. In countries where the temperature is measured in Fahrenheit, the information about PC temperature is now displayed in the appropriate units. In addition to the program database added new recommendations for the computer, as well as new PC problems that can be repaired. Offer is valid from July 24 to August 24, 2013. This version features Tweak Wizard, Services Optimization Wizard, cleaning of confidential data, protection of user and system files, new "intellectual" Game Booster, checking installed Software for vulnerabilities, PC temperature control was upgraded and added new sections of diagnostics. New Year's Offer: 30% discount to any license key of Kerish Doctor. The offer is available until January 1st. Happy New Year and Merry Christmas! Special Offer is available until December 2012. This version features Software Update Wizard that will check the installed Software for the presence of critical vulnerabilities, patches, new versions and will update them. Important upgrade of heuristic registry scan, added new diagnostics options and other improvements. 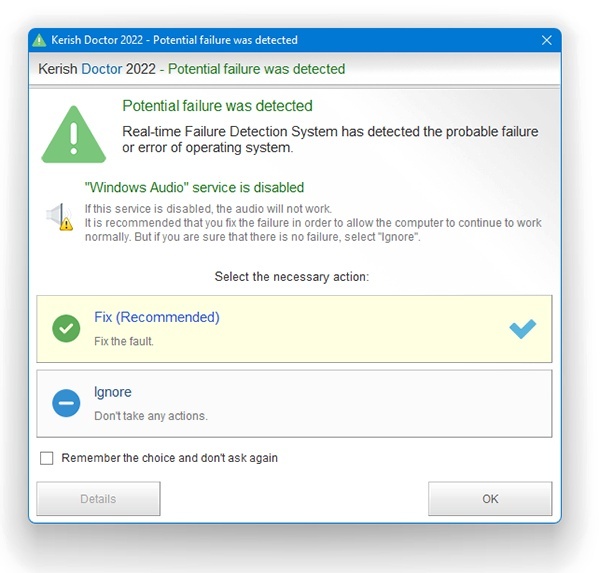 We are detected problem with startup of Kerish Doctor 2012 on some systems with enabled User Account Control (UAC). This problem was fixed in the updated components. Those users who have disabled automatic updates, we recommend to update it manually in the Update Center. This version features Troubleshooting Wizard, Recommendation Wizard, Internet Optimizer Wizard and a lot of improvements. This version features new security engine which increases the efficiency of detecting malicious programs, new design of the interface and fixed many bugs. We are happy to announce that buying Kerish Doctor 2012 has become even simpler than before. To get the license key delivered to your email address all you have to do is make a few clicks. This version features new Real-time Failure Detection System, PC temperature control and other improvements. Buy one license key and get one additional license year free of charge! This special offer is available until February 2012. This version features new utility programs and new diagnostics options. Message Center became more interactive. This version features improved system error fixing and protection, game booster, and minor bug fixes. This version features improved error fixing, system junk cleaning, optimized memory usage, and changed interface design. This version features improved "Windows Startup" tool, increased system protection efficiency, more stable component update, and improved real-time error fixing system.